View videos of pool installations and 3D models of pool designs before breaking ground. Looking to create a new atmosphere in your back yard? Call us today to get a visual of how we can transform your current boring backyard into the handout of the summer! This 3D rendering is of a pool in Jacksonville, NC. Bluewater Pools installed a pool on a Sound front property the Summer of 2011. This was the launch of the process that all began with a Virtual representation of the house and the finished product designed by Bluewater Pools of Emerald Isle, NC. 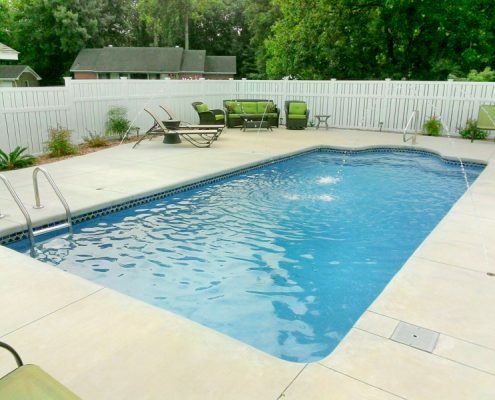 If you are interested in having your home virtually planned out with a new pool or spa – just give us a call! Take a behind the scene look at the installation of a pool in Pine Knoll Shores, NC. This was no ordinary installation – since the pool could not reach the residence by road, we floated the pool and towed it through Bogue Sound before it reached its final destination. Take a peek at some of the highlights! Enjoy!